Kisan Vikas Patra (KVP) for a very long time has been a very popular investment scheme amongst lower and middle income earners. The KVP scheme was first introduced in 1988 but was discontinued in 2011. But due to popular demands and request the KVP was re-introduced in 2014. KVP is a government investment scheme wherein an individual can invest their savings in lump-sum. On every investment made by the individual, the government pays interest at a predetermined rate . Who can invest under KVP? Every Indian resident individual who has attained majority (i.e. his or her age is more than 18 years) can opt to invest under KVP scheme. Also, a trust organization established in India can invest under the said scheme. But HUFs (Hindu Undivided Family), companies and other institution cannot invest in KVP. Also, Non Resident Indians or NRIs cannot invest in Kisan Vikas Patra (KVP). Note: In case one wants to open a KVP in the name of minor, then the major individual can open the KVP account on behalf of the minor. What amount to be invested in KVP? The KYP scheme is generally issued in denominations of Rs.1000, Rs.5000 or Rs.10,000 or Rs.50,000. The minimum amount to be invested under KVP scheme is Rs.1000. However, there is no upper limit restriction for investment under this scheme. How to open a KVP account? 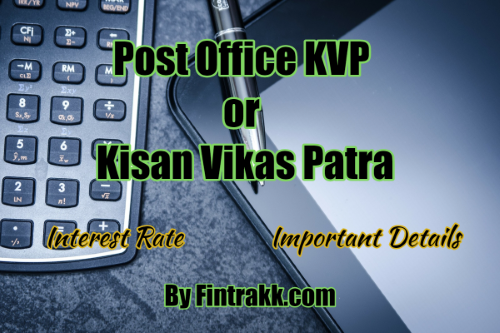 Nowadays, KVP account facility is offered by all post offices, nationalized banks, state banks and associate banks in India. The interested individual must obtain and fill the KVP application form and submit the same to near-by post office or banks. Along with application, the individual needs to provide self-attested copy of identity proof and address proof for opening the KVP account. The individual needs to provide the amount which he or she wants to invest, this amount one wants to invest can be contributed in cash, bank transfer or demand draft. There is no tax benefit for any contribution made under the KVP scheme. The interest income under KVP is chargeable to tax under the head of “Income from other sources”. The rate of interest to be earned on KVP investment scheme is decided by the government. The rate of interest is generally provided each year by 1st April. The interest earned is compounded annually. It’s said that any amount invested under KVP would be doubled after 112 months (i.e. 9 years and 4 months) as of this writing. Note: The rate of return on KVP scheme majorly depends on government policies and the on-going market situations. The interest rates are subject to change. So, kindly confirm the same from respective Post office before investing. The maximum lock-in period maturity period for each KVP investment is 112 months i.e. 9 years and 4 months. Single Holder Type certificate as the name suggests are the certificates issued to single individual in case of single holding of KVP scheme account. Also, the individual can open single holder account in the name of minor (on minors’ behalf). Joint ‘A’ Type certificate is a certificate used in case of joint KVP account holding. This certificate is issued to two adult holders of joint KVP account. Under this holding scheme the amount at the time of maturity is payable to both. In case of nomination, transfer or cancellation of KVP account signature of both the account holder is required. Joint ‘B’ Type certificate is very much similar to A type joint certificate. Under B type holding also the KVP investment certificate is issued to both joint holders. These joint holders have 100% eligible for managing the certificate. The only difference under this scheme of certificate is that at the time of maturity the amount is paid only to one of the holders. The KVP investment scheme comes with a lock-in period of 9 years and 4 months. But, in case the individual wishes to withdraw the accumulated investment before the maturity, individual can withdraw the amount only after 2 years 6 months. If you withdraw within 1 year then you won’t receive any interest. You may also have to bear a penalty for so early withdrawal. Where KVP holder has passes away. Where the KVP holder of the certificate has forfeited the amount by making a pledge. A court of law has been ordered for premature withdrawal. *The above calculation is done based on interest rate @8.7% p.a. when the Maturity Period used to be 100 months only. Apart from the premature re-cashing facility, individual also can pledge the KVP certificate as a collateral security to obtain loan. This makes the KVP scheme comparative liquid and flexible in comparison to other investment schemes like FD or fixed deposits. In cases where the KVP holder is moving from one place to another and the holder won’t be able to manage the KVP investment due to location constraint. Then the post office or bank can allow the inter location post office or bank transfer of the KVP account. The investor needs to provide transfer application at either the old or new post office or bank requesting for the transfer. The original holder to their nominee if the holder has died. In case of joint holding type A or B, the ownership can be passed within the joint holders. In case the KVP scheme certificates are lost or damaged or misplaced one can also apply for duplicates certificate copy. The post office or bank official may provide duplicate copy after verifying and validating all document proofs and application submitted by the KVP holder. Re-introduction of KVP investment, scheme provides an opportunity for many small and medium earning individuals to contribute their savings under the said scheme. KVP provides a safe and secure risk free long term investment scheme. The maturity period is now 9 years + which provides the government ample time to invest and utilize the amount invested under KVP scheme for the development of country. Thus Post KVP or Kisan Vikas Patra is a win-win investment scheme for individuals as well as government. What do you think about the KVP Scheme? Is it a good long term investment option? Feel free to share your feedback.